Got the email about upgrade to LastPass, yeah! Uh oh, asks me to login using my Webroot login/password but get "email or password is invalid". Odd because I have no problem logging in to my Webroot account. Hmm, it sounds like you're doing everything correctly. If you've followed the KB and video, and it still isn't working, I think the next best thing would be to contact support. You'll be able to walk them through your process and tell them what's going directly. Did you follow the instructions HERE and go through your Web Console to start the transfer process? If you have followed the instructions and are still having issues, then please submit a support ticket and hopefully they'll get you straightened out. I used the Upgrade Now button in the email which takes you to Web Console login. Have no problem logging into console, it takes me to Welcome to LastPass let's get started page which takes me to a login screen that says "Please log in using your Webroot username and password. This will allow LastPass to securely import your passwords from Webroot", it's this page that tells me my Webroot email or password is invalid. Ok, @KayeC , thanks for getting back to us. I will ping our Community Manager @freydrew and see if he can assist with this or if he thinks that support is the way to go. Am afraid that the process is flawed and does not take into account that one might already have the same email address set up with LastPass, which is the case for me. When I try to follow the transfer process I cannot get into LastPass because it is not recognising the password for my Webroot online account. So no transfer, so useless. Does anyone have any thoughts about how I might resolve this? I have the exact issue as Baldrick. Last Pass account with same credentials as Webroot Manager. Get as far as the continue button and nothing happens. Tried deleting LastPass accounts but the credentials seem to hang around for awhile. I can still open my account with the browser extension though I get a message that my deletion was successful. Even created an account with my other email address and still get the same result. something is wrong in the process. To make matters worse, the Webroot PW Manager stopped working and I keep getting to the Last Pass sign in screen. I've basically lost any password management at all and so far, Webroot hasn't replied to my support ticket. Frankly this is a really poorly done rollout as all it's done is broken my existing software! I was afraid something like this would happen with LastPass Free/Paid accounts and Webroot Account with the same Email for each account. Maybe Support could figure it out and combine both accounts? If that can't be done then I believe one of the Emails has to be changed in order for it to work, Webroot or LastPass and I don't know if this can be changed. Spoke with Webroot support. They passed the buck to Last Pass saying only they can fix the problem. They can't even restore Webroot's password manager to a working state. Apparently, I'm not the only one experiencing issues as Webroot support acknowledges the problem. Last Pass's response to a ticket has been slow, well, nonexistent today. Raising my hand with the same issue. Add to my problem that the lastpass installer doesn't like my 12.0 G Ram as it gives me memory issues. Would love to chat with support but can not connect to lastpass servers. Yes, I can read and yes, I can follow instructions. Not a well planned out migration. Webroot/lastpass holding my passwords hostage. Got 42 days left on this renewal. Not impressed. I've got problems with this process too, I get to the screen where you have to enter a new Master Password enter it and click on Save Master Passsword button at bottom of screen and nothing happens!! Yes, when you get directed to the LastPass/Webroot cobranded landing page click login. to a LastPass Premium account automatically. It wouldn't matter if you changed your free LastPass email, my LastPass and Webroot login/passwords are different and I still can't get in. Submitted support tickets to both Webroot and LastPass and haven't heard from either. We have restored your Webroot password management account. Please go to https://www.lastpass.com/webroot/existing and complete the migration with your webroot username and password. Once you've done this, go to https://my.webrootanywhere.com/, log in to your Webroot account, and link your LastPass account back to Webroot to receive your Premium subscription. Never got the second step to work but I didn't need to. Finally got things working (there were a lot of steps from Last Pass but in the end it worked out). I use Opera and Firefox as my browsers but ended up have to use Chrome to get past the CONTINUE button that sets you up as a Premium User of Last Pass. I also found that if you have an EXISTING extension or Add-On for Last Past, it will NOT upgrade to Premium User. You'll show up as a Premium Trial User. Delete the existing extension and install a new one. Now you'll show up as a Premium User. All in all, an awful experience. Someone owes us an apology for a pretty poor migration implementation. Still can't make it work. I don't know what LastPass did for you but what you did doesn't work for me. If I go this way https://www.lastpass.com/webroot/existing, I get "The token provided is invalid or already used. "; if this way, https://my.webrootanywhere.com/, get "Invalid email or password'. Nothing has changed since yesterday. I even removed the LastPass extensions but no joy on Firefox or Chrome. I even tried IE. I agree that Webroot owes all users a huge apology for letting the password manager software get to the point of having to create a fix in the first place by not upgrading the LastPass software, and secondly, for letting it get to the point of total failure. LastPass owes one for the failed launch. Webroot, you have totally failed your customers. LastPass, what you did for chappyware you need to do for the rest of us. OK, I have now managed to get this sorted out. But first if like me you already have a LastPass account under the same email address as you use for your Webroot Online Account, then I think that the only way around this is to delete the LastPass account. You can delete the account even if you have forgotten the Master Password, and cannot recover it (still not got to the bottom as to why I could not) using the appropriate option that you can find HERE. Of course this is the option of last resort as it deletes all the data stored in LastPass under that account. Which is what I did. "We have restored your Webroot password management account. Please go to https://www.lastpass.com/webroot/existing and complete the migration with your webroot username and password. Once you've done this, go to https://my.webrootanywhere.com/, log in to your Webroot account, and link your LastPass account back to Webroot to receive your Premium subscription." Well, that has worked for me and I have now completed the transfer successfully. I hope that the above and below can be of some use? I am a long term Webroot SecureAnywhere Complete user and therefore I use the Webroot Password Manager. There have been problems with that and I was recently contacted by Webroot to advise as follows re. moving from their Password Manager (based on an old version of LastPass) to the latest version of LastPass, i.e., a transfer of my data from the Webroot Password Manager to LastPass. The problem I am having is simple; when I reach the screen where I am asked to enter my Webroot account credentials, when I “Log In” I am told that either my password and/or email address are invalid. I am therefore unable to take advantage of the Webroot/LastPass tie up. Webroot are saying that because I managed to log in to my online Webroot account with the email address/password that is not accepted on the LastPass site it must be a LastPass issue and that I should contact you for support. Please advise as to what I can do to get the process to work, and start accessing my data via LastPass. Many thanks in anticipation of your assistance. Nope - followed all the recommendations above. All I got was frustrated. Last Pass installer still giving me a memory error. Webroot/Best Buy/Carbonite/Last Pass thanks for bouncing me all over the place and not helping. Spending the weekend buying your replacement. Deuces folks, best of luck with this issue but I'm tapping out. And who thought it was a good idea to tag this issue as solved ? Have now raised support ticket hopefully they can sort it out! Do you think you have something blocking this transmission? Like a web browser extension? Or cleaning out your cache/history? Maybe using another browser? Just ideas nothing concrete. Well this is what I got from LP "If you get directed to the LastPass/Webroot cobranded landing page click login. 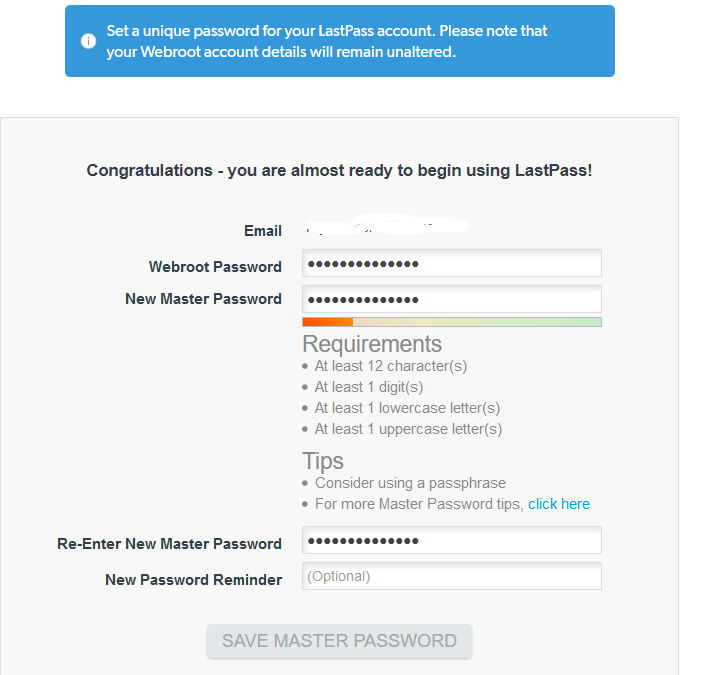 Enter your email address and master password for your existing LastPass account. If you’re currently in a Free, Premium, or Families Trial you will be prompted to upgrade to a LastPass Premium account automatically". That would be a big, fat NOPE. Oh, I can log in to my free account but don't get a prompt, so I click on the upgrade button, and of course, get to the page asking for my credit card info. I'm happy for everyone who has managed to get the process to work, but unless they come up with a solution that works for me, and everyone else, I'm just going to stick with Free LP. Thanks for your reply, I've tried using FF, Chrome and Edge browsers with Adblockers off with no success, doesn't work from my Samsung Galaxy tablet either, I'm baffled! have to see what support can find out I think! My problem with the migration was that, while I was successfully able to make a new Lastpass account, it didn't sync to Webroot. So now I can't get Webroot to work on my PC, AND Lastpass is just empty info. Submitted a ticket, but with the slow rate so many of these problems have been dealt with over the past 4 months, I'm not holding my breath. Thought I'd see if anyone here ran into similar problems?